Hello CC Lovers. It's great to see you here. Welcome to our first ever "Cook the Cake" competition. The idea of this competiton, apart from the opportunity to win prizes, is to help you build your CC baking skills. A competition will be run every two weeks and each time you will have the opprotunity to try something new. For those who don't have a lot of baking experience or those who think they are "terrible bakers", this is a chance for you to see that with the CC, anybody can be a successful baker. For each competition I will provide a basic recipe and all you need to do is bake it. Some recipes will need to be made exactly as per the instructions, whilst others will leave room for a bit of personal creativity. There will be two winners each fortnight. One winner will be judged on the appearance of their entry and the other will be a random draw. So everybody has a chance to win. So without further ado...this week's first competition. I have chosen Victoria Sponge (also known as Victoria Sandwich) because this is truly a baking classic. This is a very simple, very basic cake but it has loads of potential for being personalised to suit your needs or taste. It is a cake that was named after Queen Victoria who is said to have enjoyed eating it for afternoon tea. Traditionally the cake is made with a filling of raspberry jam and cream and topped with a dusting of icing sugar. I must say that I enjoy the cake that way but I also enoy it many other ways. So, when you make this cake, whilst you must follow the basic recipe, feel free to let your imagination run wild with ways to decorate or top and fill this cake. Perhaps a lovely lemon curd filling? Turn it into a Boston Creme Pie with creme patisserie in the centre and a chocolate ganache on top. Maybe you could smother the whole thing in a lovely thick caramel. Oh and don't forget strawberries and cream in the middle with a cloud of icing sugar on top. The sky really is the limit with this cake! I have kept mine simple in the picture. 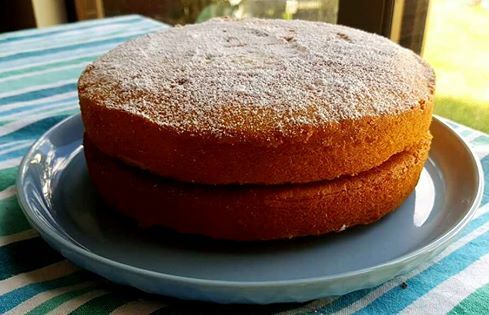 It is not filled yet and merely has a dusting of icing sugar. 1. Preheat your oven to 160 degrees. Grease and line the bases of two 20cm sandwich tins. 2. Place all ingredients in the order specified, into the bowl with the kneading blade. 4. After 30sec stop the machine and scrape down the bowl and blade. 6. When the program is complete, using the pulse button, pulse the mixture for 10 seconds. 7. Divide the mixture evenly between the two tins and place in the oven. 8. Bake for 25-30 mins or until a skewer inserted in the centre of the cake comes out clean. 9. Remove from the oven and allow to cool in the tins for 5 minutes before turning out onto a sheet of baking paper on a wire rack to cool completely. 1. Your butter must be very very soft. Not melted but soft enough to poke your finger through. 2. If you use larger tins (ie 22cm) you will need around 5cm less cooking time. 3. To ensure your mixture is evenly divided between the tins, place the tin on your scales and zero them then place the batter into the tin. Ensure each tin weights the same. 4. Place baking paper on the wire rack prevents markings on your cake. 5. 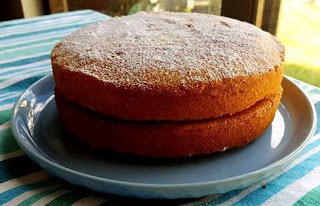 You can change the flavour of this cake by adding zest of a lemon or orange for a citrus cake. If you want chocolate, replace two tablespoons of the flour with two tablespoons of cocoa powder. 6. If you have a sociopath oven like I do, that has hot spots and you notice the tops of your cakes browning too quickly, just place a sheet of alfoil lightly over the top. 7. This cake is best eaten within 24 hours of baking. 1. All entries must be your own work. 2. Entries open 1/10/2016 and close at midnight 16/10/2016. 3. Enter by commenting on the competition post on www.lovebakingwiththecuisinecompanion.blogspot.com with your Facebook user name and by posting a picture of your cake in the competition thread in the Loving the Tefal Cuisine Companion group. 4. Victoria Sponges must be made using the recipe provided in the competition details but may be decorated in anyway you choose. One exception is that changes to the recipe may be made to cater for dietary restrictions such as gluten free or dairy free. 5. There are two prizes each is a $50 pre-paid Visa or Mastercard. 6. One prize will be awarded based on presentation and the other will be randomly drawn from all entries. 7. Winners will be announced in the Facebook Loving the Tefal Cuisine Companion group on Tuesday 18/10/16.